Located along the Tombigbee River, Columbus, Mississippi, is the seat of Lowndes County in the northeastern part of the state. In 1820, Andrew Jackson negotiated the sale of the Choctaw lands on the Black Prairie, and many people moved to the area for the new settlement opportunities. Among these new settlers, a number were Jews who saw the potential for commercial and financial prosperity. By the 1840s, there were already a handful of Jewish settlers in Columbus. Many of these families earned their living as peddlers, carrying goods in wagons in order to sell in nearby rural areas. Many of these early peddlers later became store owners. Jews became an active part of the community, from joining the Confederate war effort during the Civil War, when the Confederate army housed an arsenal in Columbus, to developing commerce in the 19th and 20th centuries. Although Jews lived in Columbus in the 1840s, it took several decades for them organize community institutions. Rather than buying their own cemetery, they purchased plots in the city’s Friendship Cemetery. In 1871, they founded a local chapter of B’nai B’rith. Although they had been praying together since the late 1840s, Columbus Jews did not formally establish a congregation until 1879, when they founded B’nai Israel (Children of Israel), which remains an active congregation today. B’nai Israel was a regional congregation, attracting Jews from nearby towns like West Point, Starkville, Aberdeen, and Macon. As a result, the congregation was always larger than the Columbus Jewish community. In 1905, an estimated 75 Jews lived in Columbus, though as elsewhere this small population had a high visibility due to their concentration in retail trade. For the most part Jews felt welcome in Columbus, but they did occasionally face anti-Semitism. In 1875, an anonymous writer criticized Columbus’ Jewish population in the local newspaper, claiming that they were “clannish” and “housed up like the terrapin within his shell” in both social and economic affairs. He also accused Jews of not buying real estate and thus not paying local property taxes, and buying their merchandise in other cities rather than patronizing local gentile-owned stores. 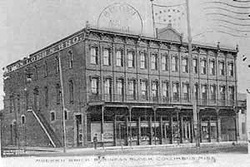 Around the turn of the century, several Jewish-owned stores were located in downtown Columbus, including: Simon Loeb and Brothers Department Store, Kaufman Brothers, L. Rosenzweig & Co., Isenberg Brothers, Feinstein’s, The Fashion Center, Loeb’s Furniture Company, S.B. Scwab, Hirshman’s Dry Goods, Rubel’s Store, and the Columbus Cash Store. Most of these were dry goods, ladies’ wear, or shoe stores. Many of these businesses lasted well into the 20th century, and were joined by others such as The Darling Shop, which was owned by Morris and Zelotta Zlotnick, The Globe, a men’s clothing store founded by Jack Gordon in 1937, Ruth’s Department Store opened by Archie Bernstein in 1940, and the Fair Store opened by Morris and Sadye Goldstein. Born in Bavaria, Simon Loeb arrived in Columbus in 1867 with little money, but he and his brother eventually became successful merchants. In 1874, Loeb created the store with his younger brother, Julius, and in the 1930s “Simon Loeb and Brothers” was the largest department store in northeast Mississippi. They sold almost everything, including dry goods, clothing, shoes, and groceries. In the early days of B’nai Israel, the congregation held Sunday school at the store. Three sons of Herman Kaufmann founded Kaufman Brothers store in 1896. The store was successful and included both a retail and wholesale operation. Herman Kaufmann was a German Jewish immigrant who had served in the Mississippi Infantry during the Civil War. After the war, Kaufmann worked as a salesman for Simon Loeb and Brothers. As legend goes, when his sons decided to open their store, the sign was too long for the narrow building, so they cut off the last “n” in their name to make it fit. Kaufman Brothers was successful for a long time, but suffered a catastrophic fire in 1931, losing $65,000 worth of merchandise. The brothers sold whatever they could that remained, and closed the store. Columbus Jews were prominent in the city’s merchant class, and took on civic leadership roles. Sidney Loeb was vice president of the local Chamber of Commerce, a founder of the Columbus Rotary Club, and on the board of the First National Bank of Columbus. Edna Loeb, the daughter of Simon Loeb, became the first female attorney in Lowndes County, passing the bar in 1936. Irvin Kaufman served as president of the Columbus Athletic Association and was later asked to serve on the board of the Y.M.C.A. When Columbus celebrated its 100th anniversary in 1921, Kaufman served on the executive committee. He was also a longtime leader of the local Elks Club. Morris Goldstein was involved in the local Masonic Lodge and the Chamber of Commerce. In addition to being involved in secular fraternal activities, Columbus Jews were active in B’nai B’rith. The local lodge raised money for Jewish causes around the country, including the National Jewish Hospital in Denver, the Jewish Orphanage in New Orleans, and the Hebrew Sheltering and Immigrant Aid Society. The lodge also provided death benefits to the dependents of deceased members. They renamed the lodge after Joseph Herz, the longtime rabbi of B’nai Israel who died in 1909. The lodge had many members from the small towns outside of Columbus, such as West Point, Tupelo, Booneville, New Albany, and Pontotoc. During World War II, the Jewish community took a strongly patriotic stance. In addition to pledging assistance to all law enforcement agencies and patriotic societies, many members of the congregation served in military. An Air Force base was opened in Columbus, and B’nai Israel served the soldiers by welcoming them into their synagogue and bringing Christmas gifts to many soldiers stationed at the base. The local B’nai B’rith lodge made a special effort to reach out to Jewish soldiers stationed at the air base and led war bond drives. Morris Zlotnick, working through the local Chamber of Commerce, brought Bob Hope and Les Brown's Band of Renown to town to raise money for the war effort. After the war, Jews in the area continued to be prominent in their communities. In nearby Starkville, Henry Mayer was the longtime owner and editor of the Starkville News. The Jewish community of Columbus has declined over the last several decades. Jewish merchants no longer dominate main street, though some Jewish-owned stores remain in town. Nevertheless, the community, which is centered around B’nai Israel, continues to be active with 18 member families.